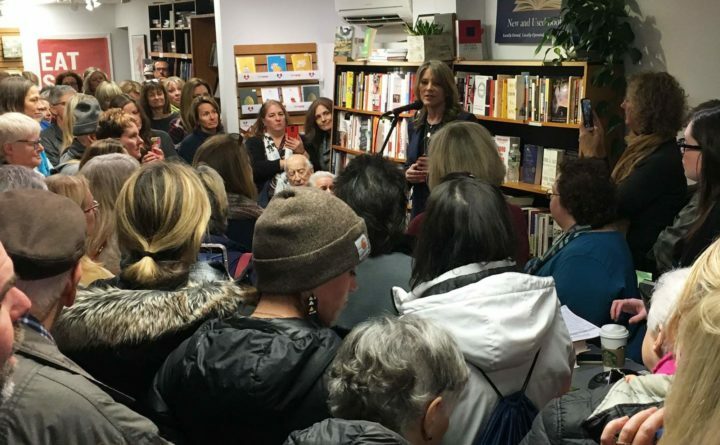 Bestselling author Marianne Williamson, at the microphone, speaks at RiverRun Bookstore in Portsmouth, New Hampshire, on Wednesday. The Democrat with close ties to media magnate Oprah Winfrey is considering a run for president in 2020. That was one of the messages Wednesday from the best-selling spiritual author, lecturer and close friend and counselor to Oprah Winfrey. Williamson launched a presidential exploratory committee in November. The likely Democratic presidential primary candidate spoke to an overflow audience at RiverRun Bookstore, her first public stop on a three-day swing through New Hampshire, home of the first-in-the-nation presidential primary. “I started an exploratory campaign in mid-November to see what kind of support and interest there might be. And I received enough positive energy to make me feel I should take the next step,” the likely long-shot White House hopeful said in an interview. According to MarianneforAmerica.com, that next step may come Jan. 28, when she makes an announcement in Los Angeles. Williamson, 66, gained fame after her first book — “A Return to Love” — became a bestseller and was featured on the Oprah Winfrey Show in 1992. Overall, she’s published 12 books, including four New York Times number one bestsellers. She’s also known for her philanthropic work, including setting up HIV/AIDS centers and founding Project Angel Food in Los Angeles. She’s also an activist, supporting racial justice and feminist causes. She unsuccessfully ran for Congress in 2014, launching an independent campaign to succeed retiring Rep. Henry Waxman of California. Williamson took aim at President Donald Trump’s administration as she spotlighted the environment. Among those in the crowd was Neil Sattin of Portland, Maine. Sattin said he’d “absolutely” support Williamson if she ran for the Democratic nomination. Williamson said she’s discussed her likely White House bid with Winfrey, who in November said she didn’t want to run for president, ending months of speculation. Williamson was also scheduled to speak Wednesday at Gibson’s Bookstore in Concord, at Rivier University in Nashua on Thursday and at Yoga from the Heart in Laconia on Friday.